To mark the 23rd of the month, invoking the 23 hours per day that prisoners spend in their cells in the SHU, activists throughout California are taking action to bring attention to prison conditions. Below Richard Wembe Johnson, a named plaintiff in CCR's lawsuit challenging longterm solitary confinement, Ashker v. Governor of California, shares his experience of being released into the general prison population after years in solitary confinement, following a settlement in the case, which effectively ended longterm solitary confinement in CA prisons. 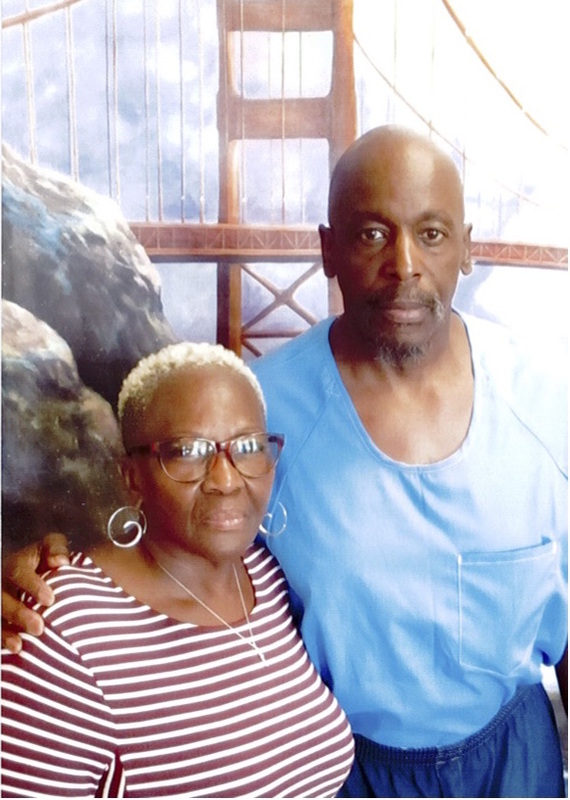 We are also excited to have a note from his sister, Yvonne Johnson, about her experience visiting him. CCR client Richard Wembe Johnson and his sister. As a result of being released from the infamous SHU aka security housing unit at Pelican Bay State Prison to the general population admittedly it’s been one extreme to the next, from total isolation into seemly nonstop interaction with others constantly. This in of itself creates a dilemma of mental and physical consternation that forbids any forward progression relative to complacency. It equates to being regulated to a of extreme heat, then put in an area of strictly cold, trying to adjust does present a major problem. Quite naturally, quasi freedom beats no freedom, as it pertain to being in prison or captivity period, however the transition is ongoing presenting numerous obstacles and adjustments that must be conquered at every turn. Small things such as getting up to walk to a dining hall for breakfast and dinner, things like going to a classroom learning various subjects, spending quality time on the yard, or having physical contact with visitors, and being able to purchase edible items from the vending machines, not to mention taking photos with love ones. It’s a wide wide range of new variables that being exposed to causes highs and lows to your psyche. Prison by its very nature is daunting on all levels, yet when the element of overexposure is instilled, it adds to the possibility of a abundance of potential behavioral complications to contend with. collaborative common ground being implored. Just like everything in life, time is the reasoning factor that ultimately will determine the outcome of any given situation be it progressive or regressive. For now as a direct progeny of this prison odyssey it’s too early to conclusively characterize its overall success or failure. All that can be done is to continue being a human being, that regardless of your status in life everyone has a seen and unseen purpose to be the best person that they can be. Having an imprisoned family member is difficult at best and the bond that keeps us connected to our loved ones is visits. Contact visits are naturally more personal, although over the years they’ve become increasingly regimented. Nevertheless, contact visits allow both parties to have some form of a normal interaction that helps the prisoner to continue to play an active role in their family unit. Non-contact visits, over a phone looking through glass, are monitored and very impersonal. They require an emotional adjustment each time. Once I recovered from watching my brother being unhandcuffed and unshackled, possibly dealt with inoperable phones and sanitized the phone, I would try to assess how my brother had fared since the last time I saw him through the Plexiglas. The clock never stopped regardless of what obstacles occurred, and by the time both of us relaxed and temporarily adjusted to our phone visit, it's would be over. I would feel empty because I couldn't hug, or kiss, or hold my brother’s hands. He would be removed and I would be once again faced with the horrific reality.